Argus Trophy 1946: The newspaper's Best & Fairest player. Carlton’s Jack ‘Chooka’ Howell holds a special place in the history of both the Carlton Football Club and VFL/AFL football. His father was a Premiership player with South Melbourne in 1918, and Chooka himself won a flag with Carlton in 1947. When Chooka’s son Scott Howell played in the Blues’ 1981 Premiership team, the Howells became the only family to have produced VFL Premiership footballers in three successive generations. While this is certainly a noteworthy achievement by a great sporting family, too often since, it has been allowed to obscure the wonderful individual career of one of Carlton’s greats. At the height of his career, Carlton coach Percy Bentley described ‘Chooka’ Howell as ‘the best tap ruckman the game has seen.’ And the list of honours Jack achieved with the Blues just adds weight to that opinion. The original Jack ‘Chook’ Howell* was an accomplished ruckman who played 40 matches for South Melbourne, including a starring role in the Bloods’ 5 point victory over Collingwood in the 1918 VFL Grand Final. He then crossed to Footscray to lead the tri-colours’ rucks in three VFA Premiership teams before his retirement in 1924. The addition of an 'a' to the nickname was often used to avoid confusion between father and son. Jack’s son inherited his name, his wirey build, his outstanding football ability and his distinctive gait from his dad, so it was inevitable that he too, would be christened ‘Chooka’ at an early age. In 1942, amidst the anxiety and disruption of World War 2, Jack junior’s good form for his local club Chelsea brought an invitation to join Carlton, and the tall youngster caused raised eyebrows from his first training run. Although he was still three months shy of his 18th birthday, Chooka was one of six debutantes for the Blues in the round two match against his father’s old team at Princes Park in May of ’42. No doubt, Jack senior wore a wry smile when the Bloods triumphed by 40 points. What turned out to be of more concern to him however, was the physical battering his son had been subjected to. Chooka was still a minor by law, so his father refused to allow him to play again at senior level that season. Soon after turning eighteen, Chooka followed the lead of thousands of other young Aussies and enlisted in the armed forces. Rather than the army, he chose to serve with the RAAF. This restricted him to only a handful of games in 1943 and ’44, and he was away for all of 1945. At last, when the war ended in August of that year, and Carlton celebrated our infamous ‘Bloodbath’ Grand Final victory in September, Chooka came back home, and looked forward to making a real start to his football career. Still insisting on wearing the supposedly unlucky guernsey number 13 that he had worn in his first match, he was a more mature, more physically prepared footballer this time around, and it showed. Quick and agile for his size, with deceptively long arms that that he used so well in ruck contests or marking duels, his return season with Carlton was a revelation. Playing mainly in the ruck, yet equally happy at centre half-forward, Chooka booted 25 goals in 17 matches in 1946. Carlton could manage only 11 wins and a mid-table finish, but Howell’s superb season gave every Carlton supporter hope that another flag wasn’t far away. He was a popular winner of the Blues’ Best and Fairest award, represented Victoria, and finished runner-up (by 1 vote) to Melbourne’s Don Cordner in the Brownlow Medal count. The delayed arrival of Carlton’s brilliant WA centreman Ern Henfry – who was forced to stand out of football for a year to earn his clearance – paid off handsomely in 1947. Sensationally appointed captain of the Blues after just two appearances while on wartime leave, Henfry led a resurgent Carlton to the top of the ladder and then to a heart-stopping, last-minute Grand Final victory over Essendon. Leading the Blues’ ruck, Chooka was one of the lynchpins of the team throughout that fabulous year. He didn’t miss a game all season, represented Victoria again and was a tireless, valuable contributor in two successive, tough finals matches against the Bombers. When rover Fred Stafford snapped the winning goal in the last minute of the Grand Final, it topped off a fairytale premiership season for the Carlton Football Club. Adding to the joy, our star centre half-back Bert Deacon won the Brownlow Medal, and both Henfry and Howell finished in the top ten. As has so often happened to Premiership clubs before and since, Carlton tumbled down the ladder in 1948, to finish sixth after an indifferent year. Among the consolations for Blues’ fans was full-back Ollie Grieve’s effort in finishing runner-up to Richmond’s Bill Morris for the Brownlow, and ‘Chooka’ Howell’s consistent good form. In his 17 games for the year, he was regularly played forward for a handy return of 38 goals. His spring, accurate judgement, long arms and strong hands made Chooka a dangerous proposition for any defender who tried to match him in a marking duel. With experience, he specialised in positioning himself behind his direct opponent, then using his reach to pluck the ball from the other player’s grasp just as it arrived. Generally reliable around the goals, he was a superb drop kick from longer distances. Giving credence to the theory that the previous poor year was nothing but a Premiership hangover, the Carlton team returned to something like their best in 1949, finishing second on the ladder and defeating minor premiers North Melbourne on the way to another Grand Final clash with Essendon. Against the Shinboners, Carlton’s key forwards Howell and Baxter ran rampant to boot 10 goals between them. Helped by the dominance of Chooka at centre half-forward, Blues’ spearhead Ken Baxter notched seven majors as Carlton won by 12 points. But a week later in the Grand Final, Essendon were far too good and slaughtered the Blues by 73 points. That defeat sent Carlton into decline again, and we dropped to 8th place in 1950. At the end of that season, Chooka accepted a lucrative offer to captain-coach in Tasmania, but the Carlton committee flatly refused his application for a clearance. A messy dispute ensued, and dragged on for months. Eventually, Chooka bowed to the inevitable and pulled his Navy Blue strip on again in 1952. Carlton’s determination not to lose Howell could have backfired on the club, but happily, the big bloke returned with the same commitment and dedication as always. His tally of 42 goals from 17 matches was good enough to win the club goal-kicking award, and his stamina in the ruck helped lift the Blues into another finals campaign in fourth place. In the first semi-final of ’52, against Fitzroy, Chooka rucked tirelessly all day, and pushed forward to kick three valuable goals. Scores were level deep into time-on in the last quarter, before the Maroons’ skipper Alan Ruthven snapped a point to win the game and end Carlton’s season. 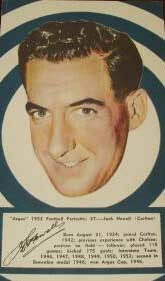 Carrying his good form through to 1953, Howell achieved two more milestones when he was appointed vice-captain of the Blues, and named an All Australian ruckman for the first time. His consistent efforts up forward for Carlton brought him another 28 goals from 17 games for the year, but fifth place on the ladder wasn’t good enough to qualify for a finals berth. Inevitably, injuries caught up with Chooka in 1954. Carlton slid further to 8th place at season’s end, partly because we were robbed of his influence for all but nine games. He still booted 22 goals in those appearances, mainly playing as a forward pocket, then at season’s end decided that the writing was on the wall and that his VFL career was over after 11 interrupted, but ultimately productive seasons. This time, a grateful Carlton committee did not stand in Chooka’s way when he was appointed captain-coach of VFA club Oakleigh for the 1955 season. He gave strong leadership to the Purple & Golds for three seasons, but was unable to lift them into finals contention before a serious knee injury placed a full stop on his career in 1957. Twenty-three years later, memories of Chooka’s exploits were revived when his son Scott, a promising 196 cm ruckman, was recruited by Carlton from Sandringham. And one can only imagine his emotion on Saturday September 26, 1981, when Scott was part of Carlton’s gutsy Grand Final victory over Collingwood. Father, son and grandson – all now Premiership players. When Jack ‘Chooka’ Howell was inducted into the Carlton Hall of Fame in 1991, former team-mates and friends were generous in their appreciation of a genuinely good bloke and one of the most brilliant footballers of his time. They recalled an easy going, good-natured, sometimes nonchalant individual - yet one who was more than capable of turning a game of football with an irresistible combination of skill and will-power. A true Blue champion, Chooka passed away on the 12th June, 1994 aged 69. "Just how much control a football club should have over a player's right to sell his ability has been raised this week in Victoria. The case is one in which Jack ("Chook") Howell, 26-year-old star ruckman, of Carlton, has been refused a clearance by his club. Howell had been offered two jobs in Tasmania, one for £35 per week. Howell's plea for a clearance should provide food for thought here as well as in Victoria. "It is wrong for a club to have the power to dictate the terms of a player's future." Howell says, "I have given Carlton nine year's service as a first-grade player, and have always done my best." Howell was born in Spotswood. He won the Argus Trophy for 1946, the newspaper's award for the Best & Fairest player of the year.
.* There is a photo of Jack Howell Snr. in Jacks' Blueseum Image Gallery at the bottom of this page. Contributors to this page: Jarusa , PatsFitztrick , blueycarlton , Bombasheldon , molsey , WillowBlue , pblue , true_blue24 , nikki , wolfister , steve and admin . Page last modified on Monday 15 of May, 2017 11:35:29 AEST by Jarusa. 1982 - The Victorious U/17's Team (Blues P.Dean & D.Forbes) 26/06/82.